No need to struggle to get a gown over baby's head. This sweet sack gown has magnetic closures, is made of silky soft Modal and comes with a matching hat. Add a coordinating "Lovey" for a complete gift! Color: * Sea The World Cherry B. 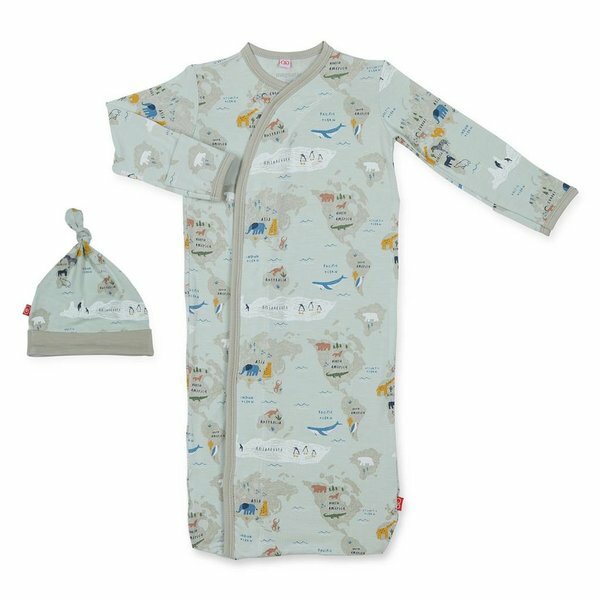 These magnetic sack gown, featuring time-saving magnetic fasteners and no over-the-head design, will have newborns dressed in a jiffy while significantly reducing their exposure to the chilly air. Quick diaper access at the bottom of the gown for frequent night changes makes life easier for new moms and dads. Includes matching reversible hat. Pairs perfectly with coordinating blanket and bib to make the ultimate baby gift for parent and baby. Modal is certified as a 100% Bio-based fabric by the US Department of Agriculture, responsibly farmed from Beechnut trees.